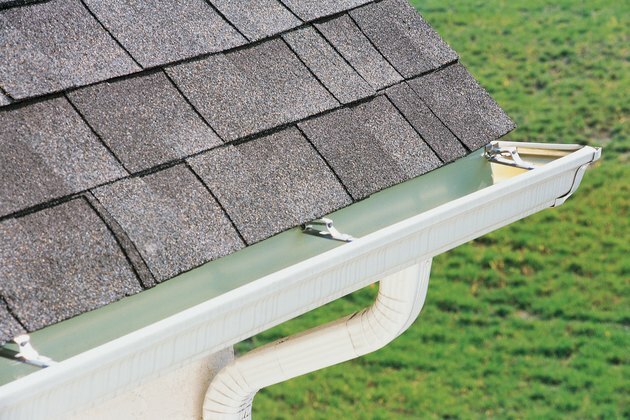 When considering alternatives to gutters, you need to take two separate gutter components into consideration. The first is the gutter itself. The gutter lines the perimeter of your roof and collects rainwater as it drains off your roof. The second is the gutter downspout, which is the portion of the gutter system that drains water out of the gutters and directs it away from your house. Gutter systems are often difficult to keep clean. PVC pipe that is 4 inches or more in diameter can be split lengthwise and used as a simple homemade alternative to a gutter. Use PVC cement to connect whole, unsplit pipe, using lengths of pipe joined by couplers. Build the entire gutter system and cement it together before splitting the pipe and couplers to create two halves. This will be far easier than splitting the pipes and couplers beforehand and having to try to cement half pieces. Once cut, mount the PVC length using gutter hangers. Mount with a slight downward angle toward the side of the house you want the water to drain to. You might be able to do away with gutters, if your area is not subject to high rainfall and flooding. Gutters are a necessity in areas with heavy rainfall and on homes where basements or crawlspaces are prone to flooding. In drier parts of the world, however, the only thing you will need to contend with is a torn up lawn or damaged pavement and cement around where the water consistently drains off of the roof. In place of aluminum downspouts for your gutters, consider using simple PVC pipe. Pipe with a diameter of 1 1/2 inches should fit nicely on the bottom of existing gutter systems, and can be screwed into the wall using PVC pipe hangers. Using PVC gives you increased flexibility because you can use elbows and couplers to whisk water to whatever part of your yard you like, as long as a downward pitch is maintained. Rain chains are alternatives to traditional downspouts or their PVC replacements. They are hung underneath the opening in your gutter where a downspout would normally be connected. They catch water as it falls from the gutter and slow its descent to prevent tearing up your lawn or patio. Some models also have chimes that create a wind chime like effect when it rains.